The Java EE Servlet model has provided the backbone of web based applications written in Java. Given the popularity of the Servlet model, it is desirable to provide a seamless experience for deploying existing and new web applications to Servlet containers operating on the OSGi framework. Previously, the Http Service in the catalog of OSGi compendium services was the only model specified in OSGi to support the Servlet programming model. However, the Http Service, as defined in that specification, is focused on the run time, as well as manual construction of the servlet context, and thus does not actually support the standard Servlet packaging and deployment model based on the Web Application Archive, or WAR format. This specification defines the Web Application Bundle, which is a bundle that performs the same role as the WAR in Java EE. A WAB uses the OSGi life cycle and class/resource loading rules instead of the standard Java EE environment. WABs are normal bundles and can leverage the full set of features of the OSGi framework. Web applications can also be installed as traditional WARs through a manifest rewriting process. During the install, a WAR is transformed into a WAB. This specification was based on ideas developed in  PAX Web Extender. This Web Application Specification provides support for web applications written to the Servlet 2.5 specification, or later. Given that Java Server Pages, or JSPs, are an integral part of the Java EE web application framework, this specification also supports the JSP 2.1 specification or greater if present. This specification details how a web application packaged as a WAR may be installed into an OSGi framework, as well as how this application may interact with, and obtain, OSGi services. Extender - Enable the configuration of components inside a bundle based on configuration data provided by the bundle developer. Services - Enable the use of OSGi services within a Web Application. Deployment - Define a mechanism to deploy Web Applications, both OSGi aware and non OSGi aware, in the OSGi environment. WAR File Support - Transparently enhance the contents of a WAR's manifest during installation to add any headers necessary to deploy a WAR as an OSGi bundle. Web Container - The implementation of this specification. Consists of a Web Extender, a Web URL Handler and a Servlet and Java Server Pages Web Runtime environment. Web Application - A program that has web accessible content. A Web Application is defined by  Java EE Web Applications. Web Application Archive (WAR) - The Java EE standard resource format layout of a JAR file that contains a deployable Web Application. Web Application Bundle - A Web Application deployed as an OSGi bundle, also called a WAB. WAB - The acronym for a Web Application Bundle. Web Extender - An extender bundle that deploys the Web Application Bundle to the Web Runtime based on the Web Application Bundle's state. Web URL Handler - A URL handler which transforms a Web Application Archive (WAR) to conform to the OSGi specifications during installation by installing the WAR through a special URL so that it becomes a Web Application Bundle. Web Runtime - A Java Server Pages and Servlet environment, receiving the web requests and translating them to servlet calls, either from Web Application servlets or other classes. Web Component - A Servlet or Java Server Page (JSP). Servlet - An object implementing the Servlet interface; this is for the request handler model in the Servlet Specification. Servlet Context - The model representing the Web Application in the Servlet Specification. Java Server Page (JSP) - A declarative, template based model for generating content through Servlets that is optionally supported by the Web Runtime. Context Path - The URI path prefix of any content accessible in a Web Application. The package dependencies for the clients of this specification are listed in the following table. JSP is optional for the Web Runtime. Web URL Handler - Provides on-the-fly enhancements of non-OSGi aware Web ARchives (WAR) so that they can be installed as a WAB. WABs are standard OSGi bundles with additional headers in the manifest that serve as deployment instructions to the Web Extender. WABs can also contain the Java EE defined web.xml descriptor in the WEB-INF/ directory. When the Web Extender detects that a WAB is ready the Web Extender deploys the WAB to the Web Runtime using information contained in the web.xml descriptor and the appropriate manifest headers. The Bundle Context of the WAB is made available as a Servlet Context attribute. From that point, the Web Runtime will use the information in the WAB to serve content to any requests. Both dynamic as well as static content can be provided. The Web URL Handler allows the deployment of an unmodified WAR as a WAB into the OSGi framework. This Web URL Handler provides a URL stream handler with the webbundle: scheme. Installing a WAR with this scheme allows the Web URL Handler to interpose itself as a filter on the input stream of the contents of the WAR, transforming the contents of the WAR into a WAB. The Web URL Handler rewrites the manifest by adding necessary headers to turn the WAR into a valid WAB. Additional headers can be added to the manifest that serve as instructions to the Web Extender. After a WAB has been deployed to the Web Runtime, the Web Application can interact with the OSGi framework via the provided Bundle Context. The Servlet Context associated with this WAB follows the same life cycle as the WAB. That is, when the underlying Web Application Bundle is started, the Web Application is deployed to the Web Runtime. When the underlying Web Application Bundle is stopped because of a failure or other reason, the Web Application is undeployed from the Web Run-time. 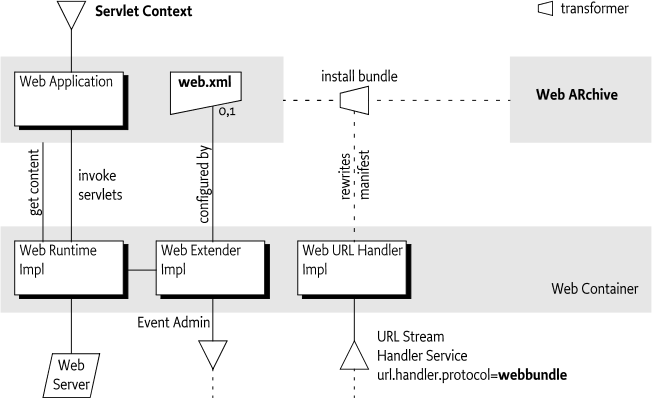 Web Extender - Detects Web Application Bundles (WAB) and tracks their life cycle. Ready WABs are deployed to the Web Runtime. Web Runtime - A runtime environment for a Web Application that supports the  Servlet 2.5 specification and  JSP 2.1 specification or later. The Web Runtime receives web requests and calls the appropriate methods on servlets. Servlets can be implemented by classes or Java Server Pages. Web URL Handler - A URL stream handler providing the webbundle: scheme. This scheme can be used to install WARs in an OSGi framework. The Web URL Handler will then automatically add the required OSGi manifest headers. The extender, runtime, and handler can all be implemented in the same or different bundles and use unspecified mechanisms to communicate. This specification uses the defined names of the sub-parts as the actor; the term Web Container is the general name for this collection of actors. Bundles are the deployment and management entities under OSGi. A Web Application Bundle (WAB) is deployed as an OSGi bundle in an OSGi framework, where each WAB provides a single Web Application. A Web Application can make use of the  Servlet 2.5 specification and  JSP 2.1 specification programming models, or later, to provide content for the web. A WAB is defined as a normal OSGi bundle that contains web accessible content, both static and dynamic. There are no restrictions on bundles. A Web Application can be packaged as a WAB during application development, or it can be transparently created at bundle install time from a standard Web Application aRchive (WAR) via transformation by the Web URL Handler, see Web URL Handler. A WAB is a valid OSGi bundle and as such must fully describe its dependencies and exports (if any). As Web Applications are modularized further into multiple bundles (and not deployed as WAR files only) it is possible that a WAB can have dependencies on other bundles. A WAB may be installed into the framework using the BundleContext.installBundle methods. Once installed, a WAB's life cycle is managed just like any other bundle in the framework. This life cycle is tracked by the Web Extender who will then deploy the Web Application to the Web Runtime when the WAB is ready and will undeploy it when the WAB is no longer ready. This state is depicted in Figure 128.2. The Web-ContextPath header specifies the value of the Context Path of the Web Application. All web accessible content of the Web Application is available on the web server relative to this Context Path. For example, if the context path is /sales, then the URL would be something like: http://www.acme.com/sales. The Context Path must always begin with a solidus ('/' \u002F). The Web Extender must not recognize a bundle as a Web Application unless the Web-ContextPath header is present in its manifest and the header value is a valid path for the bundle. The findEntries method includes fragments, allowing the web.xml to be provided by a fragment. The Web Extender must fully support a web.xml descriptor that specifies Servlets, Filters, or Listeners whose classes are required by the WAB. Has a lazy activation policy and is in the STARTING state. The Web Extender should ensure that serving static content from the WAB does not activate the WAB when it has a lazy activation policy. Wait for the WAB to become ready. The following steps can take place asynchronously with the starting of the WAB. Post an org/osgi/service/web/DEPLOYING event. See Events. Validate that the Web-ContextPath manifest header does not match the Context Path of any other currently deployed web application. If the Context Path value is already in use by another Web Application, then the Web Application must not be deployed, and the deployment fails, see Failure. The Web Extender should log the collision. 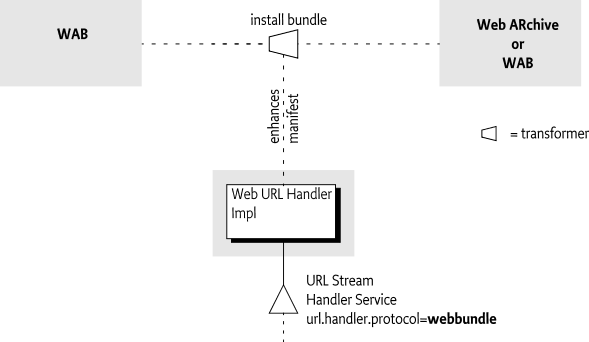 If the prior Web Application with the same Context Path is undeployed later, this Web Application should be considered as a candidate, see Stopping the Web Application Bundle. Create a Servlet Context for the Web Application. Instantiate configured Servlet event listeners. Instantiate configured application filter instances etc. The Web Runtime is required to complete instantiation of listeners prior to the start of execution of the first request into the Web Application by the Web Runtime. Attribute changes to the Servlet Context and Http Session objects can occur concurrently. The Servlet Container is not required to synchronize the resulting notifications to attribute listener classes. Listener classes that maintain state are responsible for the integrity of the data and should handle this case explicitly. If event listeners or filters are used in the web.xml, then the Web Runtime will load the corresponding classes from the bundle activating the bundle if it was lazily started. Such a configuration will therefore not act lazily. Publish the Servlet Context as a service with identifying service properties, see Publishing the Servlet Context. Post an org/osgi/service/web/DEPLOYED event to indicate that the web application is now available. See Events. If at any moment before the org/osgi/service/web/DEPLOYED event is published the deployment of the WAB fails, then the WAB deployment fails, see Failure. Any validation failures must prevent the Web Application from being accessible via HTTP, and must result in a org/osgi/service/web/FAILED event being posted. See Events. The situation after the failure must be as if the WAB was never deployed. To help management agents with tracking the state of Web Applications, the Web Extender must register the Servlet Context of the WAB as a service, using the Bundle Context of the WAB. The Servlet Context service must be registered with the service properties listed in the following table. The version of the Web Application Bundle. If no Bundle-Version is specified in the manifest then this property must not be set. The Context Path from which the WAB's content will be served. These protected directories are intended to shield code content used for dynamic content generation from accidentally being served over the web, which is a potential attack route. In the servlet specification, the WEB-INF/ directory in the WAR is protected in such a way. However, this protection is not complete. A dependent JAR can actually be placed outside the WEB-INF directory that can then be served as static content. The same is true for a WAB. Though the protected directories must never be served over the web, there are no other checks required to verify that no content can be served that is also available from the Bundle class path. Dynamic content is content that uses code to generate the content, for example a servlet. This code must be loaded from the bundle with the Bundle loadClass method, following all the Bundle class path rules. Unlike a WAR, a WAB is not constrained to package classes and code resources in the WEB-INF/classes directory or dependent JARs in WEB-INF/lib/ only. These entries can be packaged in any way that's valid for an OSGi bundle as long as such directories and JARs are part of bundle class path as set with the Bundle-ClassPath header and any attached fragments. JARs that are specified in the Bundle-ClassPath header are treated like JARs in the WEB-INF/lib/ directory of the Servlet specification. Similarly, any directory that is part of the Bundle-ClassPath header is treated like WEB-INF/classes directory of the Servlet specification. Like WARs, code content that is placed outside the protected directories can be served up to clients as static content. In this example, the tag classes in bar.jar must be found (if JSP is supported) but the tag classes in foo.jar must not because foo.jar is not part of the bundle class path. An org/osgi/service/web/UNDEPLOYING event is posted to signal that a Web Application will be removed. See Events. The Web Runtime must stop serving content from the Web Application. The Web Runtime must clean up any Web Application specific resources as per servlet 2.5 specification. Emit an org/osgi/service/web/UNDEPLOYED event. See Events. It is possible that there are one or more colliding WABs because they had the same Context Path as this stopped WAB. If such colliding WABs exists then the Web Extender must attempt to deploy the colliding WAB with the lowest bundle id. Any failure during undeploying should be logged but must not stop the cleaning up of resources and notification of (other) listeners as well as handling any collisions. A web application can be uninstalled by uninstalling the corresponding WAB. The WAB will be uninstalled from the OSGi framework. When the Web Extender is stopped all deployed WABs are undeployed as described in Stopping the Web Application Bundle. Although the WAB is undeployed it remains in the ACTIVE state. When the Web Extender leaves the STOPPING state all WABs will have been undeployed. The Web URL Handler acts as a filter on the Input Stream of an install operation. It receives the WAB or WAR and it then generates a JAR that conforms to the WAB specification by rewriting the manifest resource. This process is depicted in Figure 128.3. WAB - If the source is already a bundle then only the Web-ContextPath can be set or overwritten. WAR - If the source is a WAR (that is, it must not contain any OSGi defined headers) then convert the WAR into a WAB. The Web URL Handler can take parameters from the query arguments of the install URL, see URL Parameters. The URL handler must validate query parameters, and ensure that the manifest rewriting results in valid OSGi headers. Any validation failures must result in Bundle Exception being thrown and the bundle install must fail. Once a WAB is generated and installed, its life cycle is managed just like any other bundle in the framework. web-params ::= ( web-param ( '&' web-param )* )? The web-param <key> and <value> as well as the <embedded url> must follow  Uniform Resource Locators, RFC 1738 for their escaping and character set rules.A Web URL must further follow all the rules of a URL. Whitespaces are not allowed between terms. getQuery - The parameters for processing of the manifest. All the parameters in the webbundle: URL are optional except for the Web-ContextPath parameter. The parameter names are case insensitive, but their values must be treated as case sensitive. Table 128.3 describes the parameters that must be supported by any webbundle: URL Stream handler. A Web URL Handler is allowed to support additional parameters. The desired symbolic name for the resulting WAB. The version of the resulting WAB. The value of this parameter must follow the OSGi versioning syntax. The desired bundle manifest version. Currently, the only valid value for this parameter is 2. A list of packages that the war file depends on. The Context Path from which the Servlet Container should serve content from the resulting WAB. This is the only valid parameter when the input JAR is already a bundle. This parameter must be specified. The Web URL Handler can set or modify the Web-ContextPath of a WAB if the input source is already a bundle. It must be considered as a bundle when any of the OSGi defined headers listed in Table 128.3 is present in the bundle. For WAB Modification, the Web URL Handler must only support the Web-ContextPath parameter and it must not modify any existing headers other than the Web-ContextPath. Any other parameter given must result in a Bundle Exception. The Web URL Handler is designed to support the transparent deployment of Java EE Web ARchives (WAR). Such WARs are ignorant of the requirements of the underlying OSGi framework that hosts the Web Runtime. These WARs are not proper OSGi bundles because they do not contain the necessary metadata in the manifest. For example, a WAR without a Bundle-ManifestVersion, Import-Package, and other headers cannot operate in an OSGi framework. The Web URL Handler implementation copies the contents of the embedded URL to the output and rewrites the manifest headers based on the given parameters. The result must be a WAB. Bundle-ManifestVersion - Must be set to 2. Bundle-SymbolicName - Generated in an implementation specific way. All JARs from the WEB-INF/lib directory in the WAR. The order of these embedded JARs is unspecified. If these JARs declare dependencies in their manifest on other JARs in the bundle, then these jars must also be appended to the Bundle-ClassPath header. The process of detecting JAR dependencies must be performed recursively as indicated in the Servlet Specification. Web-ContextPath - The Web-ContextPath must be specified as a parameter. This Context Path should start with a leading solidus ('/' \u002F). The Web URL handler must add the preceding solidus it if it is not present. The Web URL Handler is responsible for managing the import dependencies of the WAR. Implementations are free to handle the import dependencies in an implementation defined way. They can augment the Import-Package header with byte-code analysis information, add a fixed set of clauses, and/or use the DynamicImport-Package header as last resort. Any other manifest headers defined as a parameter or WAR manifest header not described in this section must be copied to the WAB manifest by the Web URL Handler. Such an header must not be modified. When a signed WAR file is installed using the Web URL Handler, then the manifest rewriting process invalidates the signatures in the bundle. The OSGi specification requires fully signed bundles for security reasons, security resources in partially signed bundles are ignored. If the use of the signing metadata is required, the WAR must be converted to a WAB during development and then signed. In this case, the Web URL Handler cannot be used. If the Web URL Handler is presented with a signed WAR, the manifest name sections that contain the resource's check sums must be stripped out by the URL stream handler. Any signer files ( *.SF and their corresponding DSA/RSA signature files) must also be removed. org/osgi/service/web/DEPLOYING - The Web Extender has accepted a WAB and started the process of deploying a Web Application. org/osgi/service/web/DEPLOYED - The Web Extender has finished deploying a Web Application, and the Web Application is now available for web requests on its Context Path. org/osgi/service/web/UNDEPLOYING - The web extender started undeploying the Web Application in response to its corresponding WAB being stopped or the Web Extender is stopped. org/osgi/service/web/UNDEPLOYED - The Web Extender has undeployed the Web Application. The application is no longer available for web requests. org/osgi/service/web/FAILED - The Web Extender has failed to deploy the Web Application, this event can be fired after the DEPLOYING event has fired and indicates that no DEPLOYED event will be fired. bundle.symbolicName - (String) The bundle symbolic name of the WAB. bundle.id - (Long) The bundle id of the WAB. bundle - (Bundle) The Bundle object of the WAB. bundle.version - (Version) The version of the WAB. context.path - (String) The Context Path of the Web Application. extender.bundle.id - (Long) The id of the Web Extender Bundle. extender.bundle.symbolicName - (String) The symbolic name of the Web Extender Bundle. extender.bundle.version - (Version) The version of the Web Extender Bundle. exception - (Throwable) If an exception caused the failure, an exception detailing the error that occurred during the deployment of the WAB. collision.bundles - (Collection<Long>) If a name collision occurred, a collection of bundle ids that all have the same value for the Web-ContextPath manifest header. In order to properly integrate in an OSGi environment, a Web Application can access the OSGi service registry for publishing its services, accessing services provided by other bundles, and listening to bundle and service events to track the life cycle of these artifacts. This requires access to the Bundle Context of the WAB. A Servlet can obtain a Bundle Context from the Servlet Context for performing service registry operations. Via the JNDI Specification and the osgi:service JNDI namespace. The OSGi JNDI specification describes how OSGi services can be made available via the JNDI URL Context. It defines an osgi:service namespace and leverages URL Context factories to facilitate JNDI integration with the OSGi service registry. Per this specification, it is not possible to make the Servlet life cycle dependent on the availability of specific services. Any synchronization and service dependency management must therefore be done by the Web Application itself. The getResource and getResourceAsStream methods of the ServletContext interface are used to access resources in the web application. For a WAB, these resources must be found according to the findEntries method, this method includes fragments. For the getResource and getResourceAsStream method, if multiple resources are found, then the first one must be used. Since the getResource and getResourceAsStream methods do not support wildcards while the findEntries method does it is necessary to escape the wildcard asterisk ('*' \u002A) with prefixing it with a reverse solidus ('\' \u005C). This implies that a reverse solidus must be escaped with an extra reverse solidus. For example, the path foo\bar* must be escaped to foo\\bar\*. The getResourcePaths method must map to the Bundle getEntryPaths method, its return type is a Set and can not handle multiples. However, the paths from the getEntryPaths method are relative while the methods of the getResourcePaths must be absolute. The getResource method for localized/logo.png uses the findEntries method to find a resource in the directory /localized and the resource logo.png. Assuming the host bundle has no localized/ directory, the Web Runtime must serve the logo.png resource from the acme-de.jar. The Web Application web.xml descriptor can specify the metadata-complete attribute on the web-app element. This attribute defines whether the web.xml descriptor is complete, or whether the classes in the bundle should be examined for deployment annotations. If the metadata-complete attribute is set to true, the Web Runtime must ignore any servlet annotations present in the class files of the Web Application. Otherwise, if the metadata-complete attribute is not specified, or is set to false, the container should process the class files of the Web Application for annotations, if supported. A WAB can make use of the annotations defined by  JSR 250 Common Annotations for the Java Platform if supported by the Web Extender. Such a WAB must import the packages the annotations are contained in. A Web Extender that does not support the use of JSR 250 annotations must not process a WAB that imports the annotations package. Java Server Pages (JSP) is a rendering technology for template based web page construction. This specification supports  JSP 2.1 specification if available with the Web Runtime. The servlet element in a web.xml descriptor is used to describe both types of Web Components. JSP components are defined implicitly in the web.xml descriptor through the use of an implicit .jsp extension mapping, or explicitly through the use of a jsp-group element. A Web Runtime compiles a JSP page into a Servlet, either during the deployment phase, or at the time of request processing, and dispatches the request to an instance of such a dynamically created class. Often times, the compilation task is delegated to a separate JSP compiler that will be responsible for identifying the necessary tag libraries, and generating the corresponding Servlet. The container then proceeds to load the dynamically generated class, creates an instance and dispatches the servlet request to that instance. Supporting in-line compilation of a JSP inside a bundle will require that the Web Runtime maintains a private area where it can store such compiled classes. The Web Runtime can leverage its private bundle storage area. The Web Runtime can construct a special class loader to load generated JSP classes such that classes from the bundle class path are visible to newly compiled JSP classes. The JSP specification does not describe how JSP pages are dynamically compiled or reloaded. Various Web Runtime implementations handle the aspects in proprietary ways. This specification does not bring forward any explicit requirements for supporting dynamic aspects of JSP pages. The security aspects of this specification are defined by the  Servlet 2.5 specification.